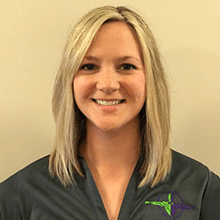 Tiffany is a Doctor of physical therapy at PT Link. She attended the University of Toledo where she graduated with her Bachelor of Science in Exercise Science in 2009 and then received her Doctorate of Physical Therapy in 2012. She has experience working with a variety of patient populations in both acute and outpatient-based settings. Tiffany has an interest in manual and muscle energy techniques and specializes in treating the spine and shoulder. She is a Certified Integrative Dry Needling practitioner and has a certification in Kinesiology Taping. Tiffany currently resides in Perrysburg, Ohio with her husband. In her personal time, she enjoys outdoor activities such as kayaking and hiking.